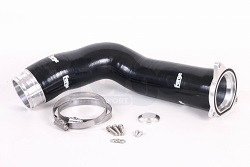 Forge Motorsport EGR replacement kit. This kit is like no other for the T5 5 cylinder 2.5 diesel engine. It not only removes the restriction of the EGR valve but also fixes the common oil leak issue with the OEM hose and coupler.The Forge CNC machined EGR adapter, blanking cap and hose coupler complete with oil resistant hose addresses all issues providing the most comprehensive kit available. The removal of the EGR valve, even those which are working perfectly, will give an increase in power, but most of the EGR valves after a period of time, compounded by those vehicles used on short journeys, will partially block and lead to power loss and poor running if they are not cleaned or replaced. This really is a worthwhile modification. Please be aware the engine management light will come on and the glow plug light will flash, which will not effect the way the vehicle drives. However you may wish to get the ECU remapped to overcome this which SP Tuning can do for you.